Sony brought the big guns to Paris Games Week 2017. In the past, PGW hasn’t been a huge date on the gaming calendar, but this year Sony held an E3-like presentation, announcing games like Ghost of Tsushima, and delivering exciting new trailers for Spider-Man, The Last of Us Part II, God of War, Detroit: Become Human, and Horizon Zero Dawn: The Frozen Wilds. The Gardens Between is a stylish new puzzler, in which you control two friends as they embark across a series of quirky puzzle box islands. The game looks beautiful, and developer The Voxel Agents is promising a story about “friendship, what it means to grow up, what must be let go, and what should never be left behind,” so expect this one to dredge up some emotions. The Gardens Between is slated for late 2018. It’s been too long since gamers have had a proper tennis title, but, thankfully, the sport is finally coming to current gen consoles courtesy of Tennis World Tour. The new game is the work of Breakpoint Studio, which is mostly staffed by devs who used to work at Top Spin developer 2K Czech, so Tennis World Tour should serve up a solid simulation. Tennis World Tour launches on PC, Xbox One, and PS4 in early 2018. Episode Ignis, the last of Final Fantasy XV’s initial run of character-focused story expansions, also showed up at Sony’s PGW presser with a release date. In the trailer, we see a young Ignis and Prompto meeting, some boating and battling, and some hints about where Episode Ignis’ story may be going. Final Fantasy XV: Episode Ignis arrives on PC, Xbox One, and PS4 on December 13. Perhaps the most innovative game Sony showed during their Paris Games Week presentation, Concrete Genie lets you coat walls with unique living graffiti. You can use your artistic creations to solve puzzles and foil a pack of bullies out to spoil your fun. This looks like one to keep your eye on. Concrete Genie arrives sometime in 2018. Yet another look at Resident Evil 7’s free Not a Hero DLC. We get more hints about Lucas Baker’s diabolical plans and glimpse a few frightening new enemy types. Resident Evil 7: Not a Hero creeps onto PC, Xbox One, and PS4 on December 12. Finally, we have another look at Call of Duty: WWII. The new trailer shows off a remade version of Carentan, one of the series’ best-known maps. The action is brutal, and definitely a lot more “real” feeling than most past CoD multiplayer modes. Call of Duty: WWII storms onto PC, Xbox One, and PS4 on November 3. 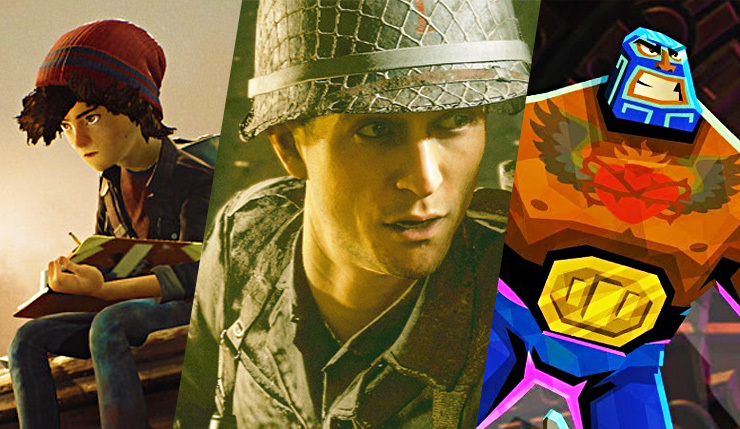 What was your favorite thing Sony showed at Paris Games Week? Did we miss anything you’re particularly excited for?